It’s July, it’s officially summer, and after last year, there where many requests… So, it’s back! Cold Brew at the plan cafe. I spent a week or so reading through my reams of cold brewing notes made in 2014, as I experimented and refined recipes, and from this I have distilled a detailed and pretty definitive recipe that I’m happy with. 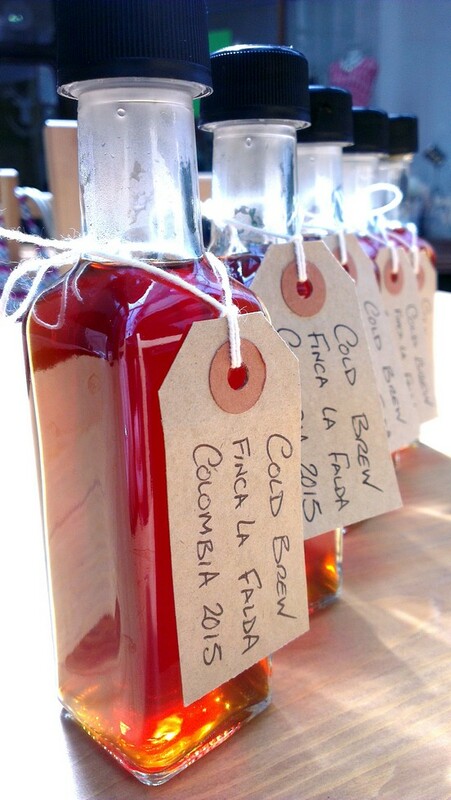 I’m launching this year’s Cold Brew with Finca La Falda, a really top, juicy, filter profile Colombian coffee, roasted by James’ Gourmet, which I suspected might be an ideal candidate, and which has yielded lovely results. This is slow Cold Brew, over many hours (although some of the magic happens in the opening seconds). For more about this brew method, there’s this post from last summer (about halfway down the post). There will be limited availability with this each day (because I can’t just suddenly brew up more if it sells out! ), and it won’t be on every day. But it’ll be a regular thing whilst the weather’s suitable, and you could always give me a shout via Twitter if you want to check. Traditional Cold Brew is often dismissed as flat, dull, chocolaty, boring, and lacking the complexity and fruity acidity we prize within speciality coffee. But it can be different, with the right coffees and techniques, you can retain the mellowness associated with cold brewing, but have juiciness too. La Falda has had bags of sugary and ripe, jellied fruity aromatics on the nose that follow through into the glass, with caramel, candyfloss, and brown sugar notes, and a soft, ripe, juicy, sweet acidity that is often distinctively melon-like along with other purple fruits. Some places have cold brew made for them, and they get it ready bottled with long shelf lives… But I make ours fresh, in small batches, on site, and we keep it for just a few days at a time. The plan (finally) has a website! We’ve recently added some nice pictures (by Xavier) of some of what we do. Take a look! We have a lovely natural process in at the moment, from a farm we know well and love: Suke Quto, Guji, Ethiopia. It’s a lovely, ripe fruity and sweet natural, which is also wonderfully clean. If you like naturals, or haven’t tried one before, try this! Our espresso blend has seen it’s components realign seasonally recently, and is now composed of Suke Quto (washed) with Santa Maria (natural) Brazil. This entry was posted on July 4, 2015 at 7:45 pm and is filed under Uncategorized. You can follow any responses to this entry through the RSS 2.0 feed. You can leave a response, or trackback from your own site. Damn, this sounds great – I love James Coffee too. I guess it’s too late to stop by and sample?